Billy Harris and Heather Agyepong in Noughts and Crosses at Derby Theatre. Design, Simon Kenny; lighting design, Joshua Drualus Pharo. Photo: Robert Day. In Rosa, the episode Malorie Blackman wrote for last year’s series of Doctor Who, the TARDIS lands in 1950s Alabama at the height of racial segregation. Not long into the episode, one of the Doctor’s friends, Ryan, who is black, notices a white woman has dropped her glove, and tries to return it to her. The woman’s husband slaps him. I think I went into Pilot Theatre’s production of Noughts & Crosses expecting a slap – that sudden shock of something hurtful, embarrassing, and true. But this version of Noughts & Crosses doesn’t slap you, it just pulls you deeper and deeper, wrapping you up in history and the present and how things are supposed to be. Sabrina Mahfouz’s play is a new adaptation of Malorie Blackman’s 2001 novel, in which Sephy, a Cross, a rich and privileged daughter of the ruling class, falls in love with Callum, a nought, a second-class citizen. The blurb on my copy of the book doesn’t mention race or skin colour; in the first few chapters, Blackman leaves it up to you to notice that Sephy is black and Callum is white. And the feeling I got from that, which is so subjective anyway, is what I unfairly expect to feel all over again from the play. And I think I keep waiting to be shown something that the book couldn’t tell me, but there’s no time for that when 400 pages of plot have to be condensed into 2 and a half hours. So instead: we get told that noughts get the menial jobs; we get told that nought history doesn’t get taught in schools; we get told that plasters don’t come in nought skin tones. And we get shown a simple story about two young people trying to start a relationship but being kept apart. And then: the noose comes down, slowly, brightly lit, with a genuinely terrifying set of stairs up to it, and the audience murmurs in panic. Callum and Sephy steal a kiss, and there are wolf-whistles, then laughter, both embarrassed and joyful. The bomb goes off and there are is actual fear, people properly jump in their seats, not just once but over and over as the sound of the blast ricochets. And when I say people, I mean teenagers – the teenagers first, anyway – and then, afterwards, released by it – everyone else, freed up by the honesty and immediacy of it all. Noughts & Crosses is the first play in a wider plan by a consortium of theatres and companies to develop more work for younger audiences. I’m so excited about that, because I love YA fiction, and I want to know what YA theatre looks like. The plays on offer when I was a teenager were a mixture of Sondheim musicals, Ayckbourn revivals, and literary adaptations. And I still don’t see many plays with teenage characters – certainly not in the same quantities that teenage protagonists populate television and film. Are there enough plays about young people, for young people, that are as challenging, demanding, and imaginative as YA books? Where are the YA plays that confront what the genre can do, and rethink the stories we feel like we can tell to young people? That’s what Noughts & Crosses did twenty years ago, what The Hunger Games and Twilight did ten years ago, and what Asking For It, Am I Normal Yet?, and Nina Is Not OK are doing now. But theatre being produced on main stages for young adult audiences is a bit chained up to the curriculum. Some of the teenagers in the audience for Noughts & Crosses were in school uniforms, or holding identical clipboards to make notes. Choices get made in this context – and this isn’t necessarily something any YA novelist has to think about, proving worth and value through how useful something will be when you’re doing your coursework. But perhaps the standing ovation Noughts & Crosses received from its teenage audience can lead to an even braver next step. 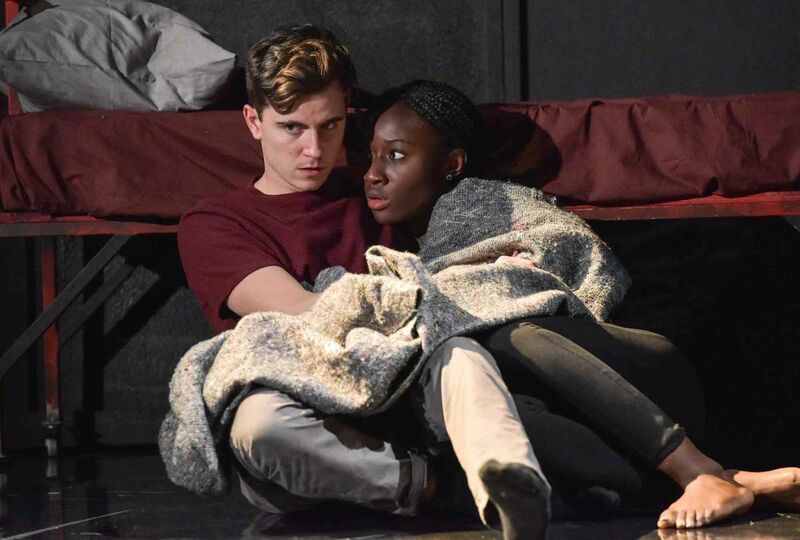 I hope what gets talked about in school this week – and amongst the people who will develop more theatre for young audiences over the next few years – is who laughed the loudest when Callum and Sephy kissed. Who jumped out of their seat when the bomb went off. And what they felt about seeing a character being led to that noose. Noughts and Crosses is at Derby Theatre until 16 February, before touring the UK until 11 May. More info here.